If you’re a fan of online slots and a fan of ice hockey then there are a couple of games which should suit you down to the ground; Playtech’s Ice Hockey is a good place to start but Break Away from Microgaming is also a good choice and that’s what we’ve been playing recently. 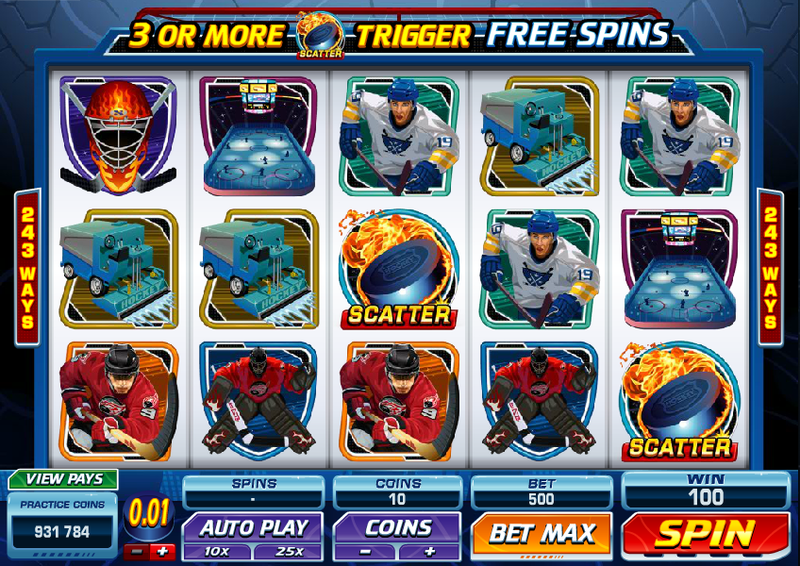 Like Ice Hockey is features a number of bonus features to keep even the most demanding of slots fans busy. 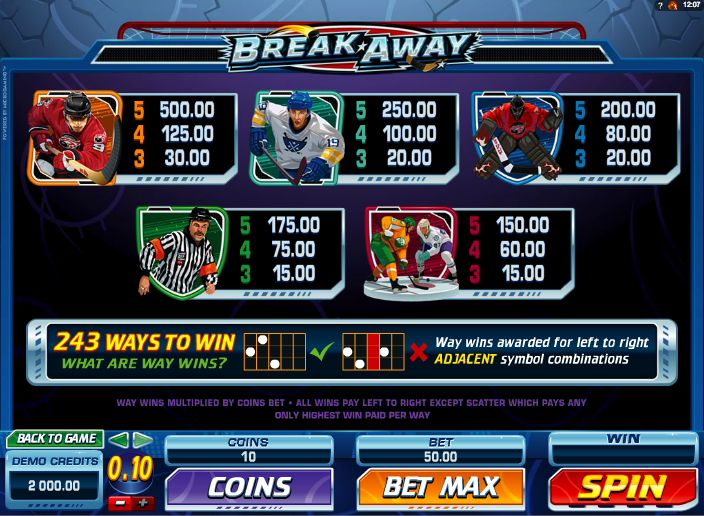 Break Away is a five reel and 243 payline slot with a dramatic, sporting soundtrack and loads of ice hockey-related symbols. From low to high value we have an ice resurfacer, a pair of skates, a goal tender’s helmet, a rink, a face off, the referee, a goal tender and a player from either team. There’s also two special symbols – a fiery puck scatter and a break away wild symbol. This is an exciting feature which occurs randomly in the game and the first sign it’s happening is when the Break Away sign at the top freezes up. A player will then skate across the screen and bash into a reel, turning it wild. This is a feature we always appreciate in a slot and it’s almost like getting a free spin whenever you make a winning combo. When you create that combo those symbols will freeze and shatter, allowing new symbols to fall into place with the chance of making new winning lines and continuing the process. Landing three, four of five of the puck scatter symbols will reward you with fifteen, twenty or twenty five free spins. That’s all good but the rolling reels feature remains active throughout those spins. Even better, for every consecutive win you spin using rolling reels, the multiplier will increase by one up to a maximum of 6x; as soon as you stop creating wins the multiplier reverts to 1x. This is an action packed slot with a relentlessly dramatic soundtrack and tons of extra features. Those features seem to get triggered pretty often so there’s always something happening. This slot is well worth a go.